As for the aesthetic, Michelle Phan explains nicely why Tim Burton makes the perfect match for Alice. She also finds a fly way to tie it back to that makeup thing she does on YouTube. Advertisers are creaming themselves over cosmetics how-tos right now because girls like me tank hours watching them and totally forget that the water on the stove's been boiling for oh, half an hour. These videos also present juicy opportunities to name-drop products and put them in users' hands. I totally didn't mean to make this post a plug for Michelle Phan and vanity tutorials. But since we went there, here's a slightly vapid video review of ELF Cosmetics, a company the vlogger -- who is not Michelle Phan -- incidentally found through Twitter. Marketers note: compelled by ELF's Twitter outreach, the girl admits this is the first time she's bought cosmetics online. I smell golden opps for impulse buys! Meh. 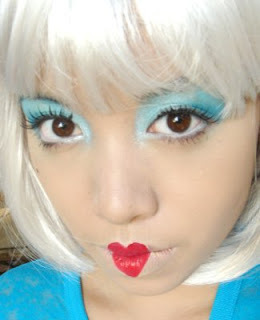 Let's move on to this picture of Michelle Phan experimenting with Alice-inspired makeup. She kinda drifted into Lady Gaga territory though.